photo magazine, photographing small objects and Mr Tumble! 2: How to get $300 of valuable digital photography goods for just $15. 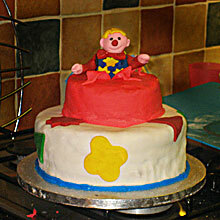 3: And how to make a Mr Tumble birthday cake! I'll start with the first and third - Mr Tumble cakes and eBay. The cake you see pictured here is the one my wife made for our daughter's second birthday. And after spending so much time making it she then took a few snaps for the family album. And here's where the eBay part comes in. Tip 1, Eliminate as much clutter as possible from the background. Tip 2, Get as much light as you can onto your object (use table lamps, spotlights...anything that will add light). Tip 3, If it's small enough, and you have a white bath, photograph it in the bath. Light will reflect from the sides of the bath to illuminate yout object perfectly and the white background will look professional. Last year you might remember that I got together with a good friend of mine, Amy, to deliver a great photo gift for all my readers. Amy is a photographer, author and teacher and has a real knack for making difficult photography techniques seem easy. Well, this year, we've done it again. A special offer for all my readers! Amy publishes a monthly online photography magazine stuffed full of photography tips and ideas. She also includes video tutorials to make things really clear and simple. And there's a monthly photography competition where you could win $50! In this year's offer Amy is giving away the last 18 back issues of her magazine (worth $270), a copy of her eBook "Powerful Landscape Photography" (worth $30) AND a copy of "Digital Photography Techniques (worth $17) all for just $15 per month subscription. Risk free! If you sign up for the subscription, and then decide that it's not really for you, you can cancel - and still get to keep all the free gifts. You can cancel at any time, but to be honest the magazine is so good I doubt you'll want to. In fact, of those who subscribed last year 87% continued their subscription! Click to read all about Amy and to view the offer. You'll see at the top of Amy's page that this is an offer for "digital-photography-tips.net readers only". This really is only available to you and you alone. It's not available anywhere else on the web. You'll also see that you only have until January 31st to subscribe. After that the offer is gone. Take a look at the offer now. I promise you wont be disappointed! Phew! Sorry if I've gone on a bit. I was also going to add that if you have any New Year's Day photos that you would like to add to the New Year's Day 2010/11 page you only have a few days left to submit them. On 31st of January (everything seems to be ending on the 31st of January!) the page will close to new submissions. PS: I'll send out only one more reminder for Amy's offer. And then it's back to one newsletter per month, promise!